We go to restaurants to celebrate milestones, to break bread with our loved ones, to create memories over a meal, and of course to eat good food. Deaf restaurant patrons are no different. When a restaurant understands the needs of Deaf customers and is willing to accommodate them, it elevates the experience from an average experience to an extraordinary one. Deaf people tend to linger at establishments for long hours, and that’s a cultural phenomena that most restaurant owners, bartenders, or hostesses may have observed. In our article,“Tick, Tock, Tick, Tock: The Long Deaf Goodbye, Explained", we explore the reasons why. Though this may affect your table turnover, a positive attitude and patience with a table of “lingering” Deaf guests may help ensure good tips and years of repeat business. While running a dining business, it's important to understand the digital side of how deaf patrons communicate. Sign language and speech-reading are one thing, but texting, videophone, and Relay Calls are essential digital tools. No matter how many phone spammers or telemarketers you've gotten in the past, always stay on the line long enough to see if the person speaking is a relay operator speaking on behalf of a deaf/hh caller. If you hang up on a deaf patron who was calling to make reservations for a huge birthday dinner for 20 friends, that's the kiss of death for large profits. If your restaurant has round tables, consider seating Deaf customers there. The configuration allows for improved sightlines, which results in being able to see all signed conversations at once. A dim setting might be romantic for those that don’t depend on their vision for communication. For those of us that require well-lit areas for signing or speechreading, however, it's a huge turn-off. A restaurant that is willing to turn up the lights and seat Deaf patrons in a brighter part of the restaurant goes a long ways. Even bringing a penlight to read the menu and facilitate ordering makes a big difference. When someone sits or stands in front of a bright light, it can be hard to see. While that sunset might be beautiful and the water view sublime- often Deaf patrons will ask if they can lower the blinds/shades on the window or ask to be seated where there is no glare to contend with. A wait staff that accommodates these requests is really seeing the light. Some guests may opt to point at a menu item. Be sure to follow their hands to see what it is they are pointing at. Hearing people might feel uncomfortable pointing, but rest assured Deaf people use it as part of their daily communication. Also, many Deaf individuals are tech-savvy and may opt to use their cell phones to communicate their order. Restaurant staff- from the hostess, to the waiter, to the folks who clear the table that employ using their index finger and gestures to convey their message are really getting the point across that they’re down with Deaf customers. It doesn’t take much to leave a #deaffriendly impression. 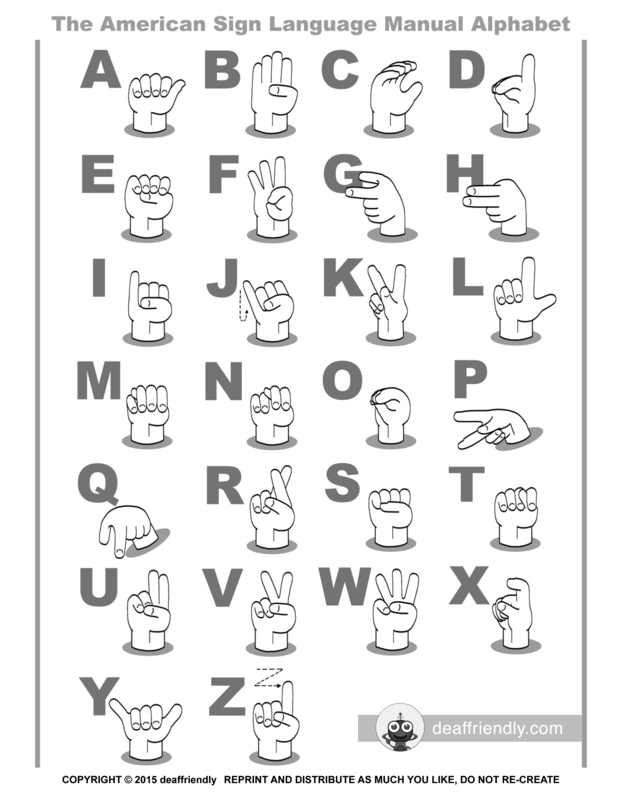 Something as simple as learning your ABC's in Sign Langauge or the sign for “thank you” can go far in creating a positive, accessible interaction with Deaf customers. At www.deaffriendly.com, a review site where Deaf customers review #deaffriendly businesses, we often see the results of #deaffriendly and #deafchallenged experiences our reviewers face. It’s pretty straightforward, good experiences net good reviews, bad experiences result in bad reviews. We know too, that a review is often where it all begins and the education that follows helps bridge the gap. So we’re here, with a smile on our face and a little hand-holding, sharing deaf-friendly tips so that we can help to create a #deaffriendly world together.